My review of Star Trek Discovery's "Si Vas Pacem, Para Bellum" (the first script by my buddy and fellow Trek novelist Kirsten Beyer!). The essay I wrote for my promotion to third-degree black belt. I'm on The X-Cast's "podwatch" episode 25, discussing "Our Town" and "Anasazi." A review of Nights of the Living Dead that singles out my story "Live and On the Scene" for high praise. From the archives: my 2014 blog post about the 20th anniversary of my fiction writing career getting started. My traditional Veterans Day posting of the poem "In Flanders Fields." My review of Star Trek Discovery's "Into the Forest I Go." From the archives: a remembrance of Shuseki Shihan William Oliver, who founded the karate style I train in, written in 2014 on the tenth anniversary of his death in November 2004. For my 4-Color to 35-Millimeter feature, I covered The Punisher (1989), The Punisher (2004), and Punisher: War Zone. 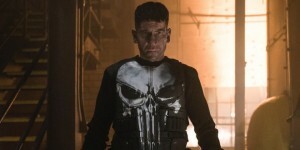 Then I gave my first impressions of Marvel's The Punisher on Netflix after the first three episodes, followed by my review of the entire first season of the show.